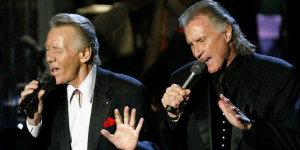 DURING AUGUST GreatGold.fm Internet Radio is Spotlighting Music Artists who were born during August, such as Bobby Hatfield (born Aug. 10, 1940, died 2003) of the Righteous Brothers [pic-left with the RB’s Bill Medley]. We’re doing that by playing August Born Birthday Stars’ hit songs from the 1950s, 60s, 70s, 80s, 1990s, 2000s and the 2010s, more often than normal. THIS MONTH, we’re also returning to a tradition we started about ten years ago. We’re including a category of new and independent music artists, singers and songwriters with some outstanding works that deserve to be heard. We’re drawing songs from the new and independent category at least once an hour throughout the day this month to add some fresh spice to the GreatGold mix. Many of the tunes from this category are hand picked for qualities destined to possibly make them the Classic Hits of the future. STARS BORN IN AUGUST INCLUDE: WHITNEY HOUSTON; RONNIE SPECTOR of The Ronettes; ISAAC HAYES; DINAH WASHINGTON; CONNIE STEVENS; TOMMY SANDS; VALARIE SIMPSON of Ashford and Simpson; SHANIA TWAIN; LEANN RIMES; RICK SPRINGFIELD; JUNIOR WALKER of Junior Walker and the AllStars; JOE JACKSON; DON HO; DAVID CROSBY of Crosby, Stills, Nash and Young; STEVE MARTIN; EYDIE GORME; MADONNA; BELINDA CARLISLE of The Go-Gos and solo artist; JACKIE de SHANNON; REGIS PHILBIN; BILLY RAY CYRUS; DARYL DRAGON of Captain and Tennille; MICHAEL JACKSON; VAN MORRISON; ROBERT CRAY; TIM BACHMAN of Bachman-Turner Overdrive; RICK COONCE of The Grass Roots, and many more. SEE THE COMPLETE LIST of GreatGold musicians and singers who were born in August on our HOMEPAGE. GREATGOLD is GreatGold.fm, ClassicHitOldies.com, GreatGoldHits.com and GreatGoldMusic.com. No matter which you choose, you'll always get GreatGold. We play Classic Hits from the 1950s, 60s, 70s, 80s, 90s and the best of the 2000s, 2010s, and beyond. Sometimes you'll hear a song in the Rock category, or Pop, Blues, Motown, Disco, Soul, Country Crossover, Soft Rock, male and female singers, boy bands, girl bands, and once in awhile you may hear an outstanding independent or new artist with a Classic Hits Wannabee. 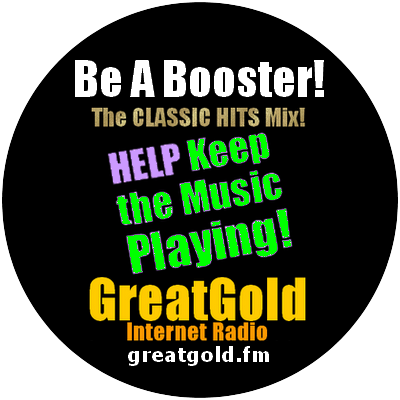 The GreatGold Classic Hits Mix consists of, generally, Top 40 hits from the past, and, occasionally, songs that should have been. We play the Best of More Than 60+ years of The Greatest Music from Life's Soundtrack. The finest of the last half of the 20th Century, mixed in with gems from the 21st Century. No matter which Genre the Songs first fell into, or, which type of radio station first played them, it's a tune we call GREATGOLD, and, part of the History of Rock and Roll. THE GREATGOLD STREAM is the place to be for 24 hours of blissful listening everyday. We have a healthy serving of delicious songs from the Soundtgrack of Your Life. Only the finest survive the wars of GreatGold Hits, and We Always Play The Greats at GreatGold.fm Intgernet Radio.